RBTH presents a selection of views from leading Russian media on international events, featuring reports on the nuclear deal reached between the P5+1 and Tehran in Switzerland and the growing destabilization of Yemen, as well as analysis of the uncertain situation surrounding local elections in Ukraine and the Donbass region. The Kommersant daily business newspaper reports that Teheran and the P5+1 group of six major powers (the U.S., Russia, China, the UK, and France, plus Germany)have reached an agreement on key parameters relating to Iran's nuclear program following eight days of talks in Lausanne, Switzerland. Citing Iranian President Hassan Rouhani, the newspaper writes that the preparation of the project document should be completed by June 30. 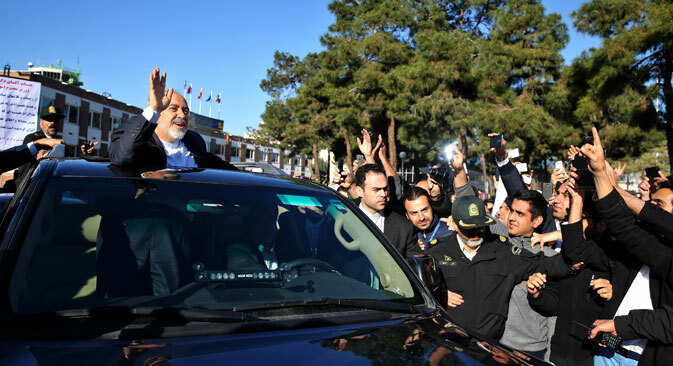 According to preliminary information, the agreement includes an accord to send a large part of Iran’s enriched uranium abroad, as well as the deactivation of two thirds of Iran's 19,000 centrifuges. Kommersant writes that the positive result of the talks, which had been on the verge of failure, now provides a strong argument for advocates of ending Teheran's isolation. At the same time, however, the newspaper says that it is still too early to speak of a final solution to Iran's nuclear crisis. Until the end of July diplomats and experts must work on an important draft that has to guarantee the implementation of the agreements reached. The Vedomosti business daily cites the words of Ukrainian President Petro Poroshenko, who has announced that even if the anti-terrorist operation against rebels in the eastern Donbass region continues, it will not prevent Kiev from holding planned local administration elections on October 25, after which the "lion's share" of authority will be transferred to local government organs in the course of the process of de-centralization. However, Poroshenko did not clarify whether this also included the Donbass, which is controlled by the insurgents. A Vedomosti source within Ukraine's presidential administration remarked that it is still too early to say if the elections will take place in the unrecognized Donetsk and Lugansk “people’s republics” of the Donbass, since everything depends on the implementation of the Minsk Agreements. In his opinion, Kiev "would be interested" in simultaneous elections, but everyone there thinks that the self-proclaimed republics will not accept this, merely in order to distance themselves from Ukraine. "The republics need strong guarantees that Kiev will carry out its obligations just to talk about the elections, let alone to agree on the specifics of the electoral process," says Alexei Chesnakov, director of the Institute of Political Affairs. Chesnakov believes that with the current wording of the law it will not be possible to agree on a special status during the elections. The centrist newspaper Nezavisimaya Gazeta writes that the port city of Aden, from which the country's president Abd Rabbuh Mansur Hadi, had led the counterattack on the Ansar Allah Houthi group before fleeing to the Saudi capital Riyadh, has been overwhelmed by the insurgents. Their military success has even surmounted Saudi Arabia's counteroffensive: The kingdom's air force has been bombing Houthi positions for a week. Nezavisimaya Gazeta writes that in the course of the fighting the premises of Russia's consulate-general was damaged. "It is not entirely correct to interpret the situation in Yemen only through the prism of Shiite-Sunni confrontation," says Vasily Kuznetsov, a scientific collaborator from the Institute of Middle East Studies at the Russian Academy of Sciences. "The reasons for today's crisis go beyond the religious differences. I would characterize this as a battle between Yemen's internal elites," he said. Kuznetsov believes that if the military action expands, confrontation will grow and the only victor in the end will be the radical Islamic groups.